Please complete your details below and we'll get in touch to discuss your requirements. Use the ticketing software that powers some of the world's best ticketing companies. 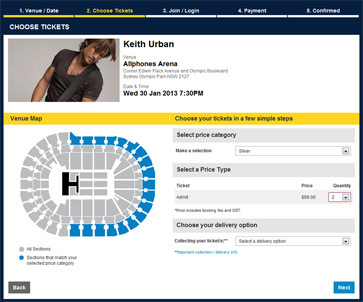 Softix ticketing software delivers performance and features to help you sell more tickets. Your customers have gone mobile, why haven't you? Market, sell and deliver your event tickets with our complete mobile ticketing solution. Do you want to deliver better customer service while lowering costs? Align your infrastructure investment with customer demand by deploying your Softix platform in the cloud. 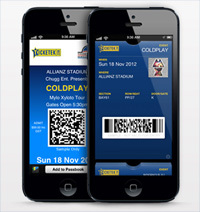 Softix mTickets now support Passbook integration on iOS6 devices. Just click Add to Passbook on your mTicket to store your tickets in Passbook alongside your boarding passes and loyalty cards. Invite a Friend turns your customers into social marketing gurus. Fans can purchase their own tickets and place seats next to them on hold for a limited period for their friends to buy. With endless entertainment choices, putting the right content on your home page is critical for increasing your ticket sales. Personalise the home page experience of each customer to match your content with their interests. Go fast without sacrificing features. Do you need a ticketing system that can sell the hottest of hot events without having to turn off the features your customers expect? Then Softix software is what you're looking for. The Softix platform is a multi-channel ticketing powerhouse, delivering real-time, integrated online, mobile, box office, call centre and season ticketing out of a single scaleable platform. With scalability proven through ticketing some of the largest events on the planet, Softix will grow with your business to support thousands of venues, events and promoters on a single system. If you're looking to step up your ticketing software to the next level get in touch with us to find out more. Multi Channel Ticketing Reach all your customers with our integrated, multi-channel ticketing software. From online and mobile ticketing to box office, call centre, speech recongnition and white label season ticketing, the Softix platform can fulfil your ticketing network needs. Proven Performance With almost 40 years experience, we've faced our share of big on-sales, from hit concerts to international sporting events. Your Softix system can scale to meet the most intense demand while still delivering real-time reserved seat ticketing capability. Flexibility Hundreds of event configuration options, full website design control, flexible paper, pdf and mobile ticket formats, customisable CRM, permissions and business rules. With Softix, your business is not limited by generic software. Take complete control of your ticketing. Integration Our open and extensible system can inegrate with local payment systems, access control solutions, third party CRM and Data Warehouses and much more. Connect kiosk, speech recognition and other channels using our feature rich API. Take Control Offer white label websites, deploy in multi-lingual environments, customise your reporting. Your Softix ticketing system will give you the competitive edge you've been looking for. Online ticketing that works. It's time to stop worrying about your website. If your current ticketing website melts under the pressure of a big on sale, you need Softix PowerWeb. Ready to scale up to the most demanding workloads, PowerWeb delivers an outstanding customer experience under the toughest conditions. Your events will shine with rich marketing features like the Super Hero, integrated hero video and interactive seatmaps. Use Invite-a-friend to take social ticketing way beyond likes and tweets. Our dynamic content personalisation allows you to target your event content to each customer based on their location and genre preferences. Our built-in content management system helps you to deliver timely and targeted content to your users and gives you complete control over the design and behaviour of your site. Featuring seamless inetegration with PowerWeb Mobile, you can manage all your content in one place. Need a custom field or site behaviour? Simple, just add a custom field to the CMS and place the content and behviour anywhere on your site with the included controls and plugins. PowerWeb Mobile. Your tickets in the customer’s hand. More of your customers are switching to mobile every day. Without a fully featured mobile ticketing solution, your event marketing may be falling on deaf ears. PowerWeb Mobile delivers the event marketing and ticket sales capability of PowerWeb to any modern mobile device. 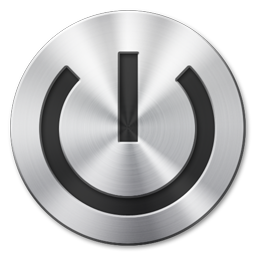 Your desktop and mobile content is managed in one place with PowerWeb CMS. Customers can have their tickets delivered direct to their smartphone using Softix mTicket so you can sell tickets right up to the event while avoiding endless lines at will call. 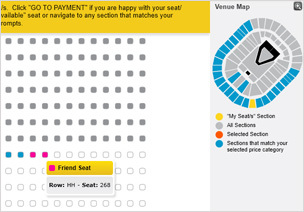 Customers can even forward tickets direct to their friends' phones as while buying their tickets. No more fumbling with other peoples phones and confirmation messages at the gate. PowerWeb Mobile was built from the ground up to be super fast. Pages load quickly and the purchase process adapts automatically to your event configuration so that the number of steps is minimised, reducing load on your data centre, keeping customer data plan usage down and delivering the best possible user experience. We’ve been ‘round the block a few times. With nearly forty years in the business we’ve learned a thing or two about ticketing. From our origins as the Bay Area Seating Service we've been building innovative, high performance ticketing software for years. The Softix team is an integral part of the Ticketek business. We take our direct experience in ticketing operations and build it into our software to create a ticketing system that delivers benefits and growth opportunities for your business. As an added bonus, most of our team, including many of our developers, have worked in ticketing roles so they understand your business and your priorities. 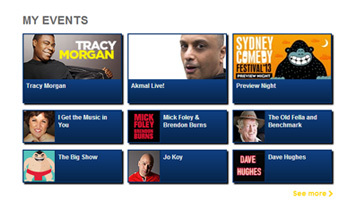 Softix is owned by TEG Pty Ltd, Australasia’s leading ticketing, data analytics and live entertainement company. In addition to Softix its assets include Ticketek, TEG Live, TEG Analytics, TEG Rewards, Eventopia and Qudos Bank Arena.